Remember Radio: Workers...Your Wages Could Be Going Up in 2017!...See if You're One of Them! Workers...Your Wages Could Be Going Up in 2017!...See if You're One of Them! 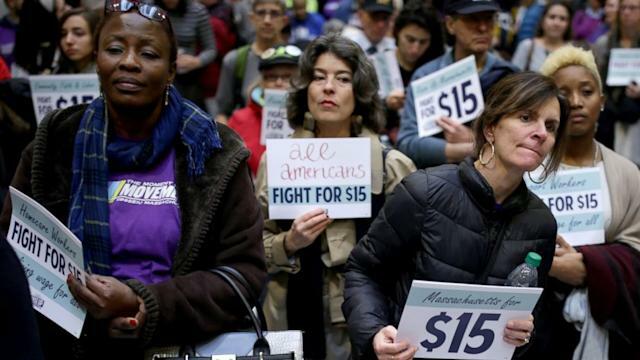 Nineteen states are raising the minimum wage today in a shift that stands to lift the income of millions of workers. The minimum wage will be increased in Alaska, Arizona, Arkansas, California, Colorado, Connecticut, Florida, Hawaii, Maine, Massachusetts, Michigan, Missouri, Montana, New Jersey, New York, Ohio, South Dakota, Vermont, and Washington to start 2017. Oregon, Washington, D.C., and Maryland will see wage increases in their states later on this year. Wages will be increased by different amounts in different states, and sometimes by different amounts within those states. New York state, for example, will see the minimum wage rise to $11 in New York City, $10 in downstate suburbs, and $9.70 elsewhere. Small businesses in the city will increase the wage to $10.50 for city employees, ABC station WABC-TV in New York reported. Alvin Major, a New York City fast-food worker, and 51-year-old father of four, told The Associated Press that the increase in pay will make a difference in people's lives. "The price of food has gone up. Rent has gone up. Everything has gone up," Major said. "This will make a difference for so many people." The federal government has not raised the federal minimum wage in over seven years, when it was raised from $6.55 to $7.25 on July 24, 2009. The Economic Policy Institute (EPI), a non-profit American think tank based in Washington, D.C. that "seeks to include the needs of low- and middle-income workers in economic policy discussions" through the publication of research and policy discussions, noted in a post published in July 2016 that the federal minimum wage, which is sets a floor at $7.25 per hour, would be much higher if it had kept up with a growing economy. "As the top line in the graph shows, had the minimum wage kept pace with rising productivity [from 1968], it would be nearly $19 per hour today. Not $7.25," EPI said in the post. Many business owners, however, oppose increasing the minimum wage on the grounds that in some cases it could make it hard for them to turn a profit. Some restaurant owners may consider reducing portion sizes or charging for side dishes that were once included in the price of a meal to absorb the increase, Melissa Fleischut, president of the New York State Restaurant Association, told the AP about the decision. Sen. Bernie Sanders of Vermont, who made raising the minimum wage a central issue of his campaign for the Democratic nomination in 2016, referred to the #Fightfor15 movement on Twitter today, a group that has advocated for a minimum wage increase to $15 per hour on behalf of employees who they argue are underpaid and struggling to survive, saying that "people everywhere" see justice in the movement to achieve higher pay for low wage workers. Sanders referred to "huge progress" in the battle to raise the wage to $15, which could be read as an oblique reference to the changes taking place today across America. "The #Fightfor15 started only 4 years ago. But huge progress has already been made because people everywhere see the justice of that idea," Sanders tweeted today.